I decided to do some colour block negative space holos with some dotted glitter placements - all very simple and quick to do. I'm not sure how I feel about mix n match nails so I've shied away from it in the past but I've seen some beautiful mix n match nails from other nail artists that I absolutely love so I'm sure I just need to come up with a design that I truly love to fully appreciate the mix n match technique. I based my design on the purple holo that is Eternal Beauty by Color Club - I just recently bought some Color Club holos that I've always wanted but never bought and this is one of them. I will have to do some proper swatches one of these days so I can show you guys why Color Club holo's are amazingly superior to any brand I've ever tried. 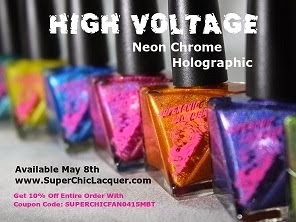 Their linear holos are super intense and wonderfully opaque - what's not to love?